Time is a precious thing. It’s only once you don’t have though to you begin to realize how precious it really is. There are different types of “times”: personal time, professional time, family time, friend time, etc. I seem to be short on all of these “times” these days. Having a six month old baby (who doesn’t sleep) and back at work full time has at times felt more like I’m a professional juggler than a mom/food stylist/blogger/culinary editor (the list goes on: wife, daughter, sister, friend, etc.). Danya, is not only my friend and colleague, but has become a mentor to me; she is someone who juggles her professional world and her personal world (mother of two small kids), with as much finesse as Michael Jordan in his glory days. With all her finesse, Danya is too, as one can imagine, short on time. When the two of us get together for a Matkonation photo shoot, it is supposed to be our personal time. The blog, which differs from our day to day shoots (done for clients), is our creative outlet to provide our readers with our personal output- photos and recipes which provide the reader first with eye candy and second with good recipes. On our last shoot, we ended up getting “stood up”, by someone who was supposed to do a guest post on the blog. A sort of culinary stand up one could say. With not much time to spare, and a post which had to be done and a lunch that needed to be eaten, this pasta came out to be just what we needed when short on time. 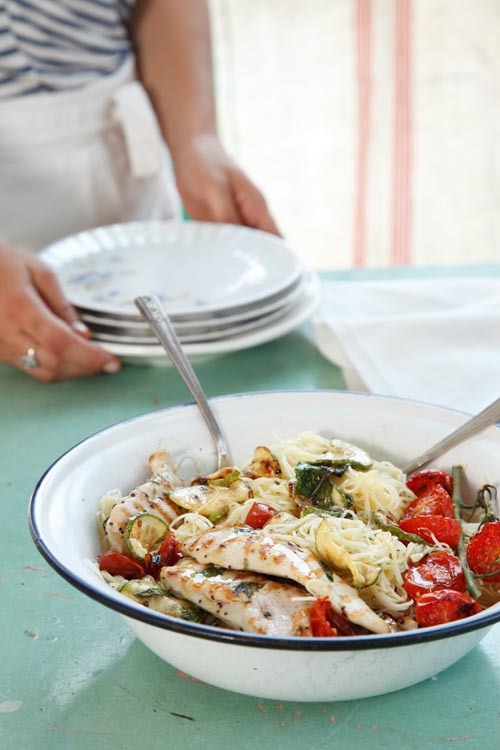 Place the olive oil, basil, mint, chili pepper, zucchinis and cherry tomatoes in a large bowl. Allow to marinate for 15 minutes. Meanwhile, place a large pot of salted water on high heat until boiling (for later use to cook the pasta). Heat a cast-iron grill pan until very hot. Place the zucchinis and cherry tomatoes onto the pan, season with salt and pepper and allow to cook for about 5 minutes, until softened. Meanwhile, place the chicken into the bowl with the marinade and allow to sit until the vegetables are done cooking. Turn the zucchini and tomatoes over and cook for an additional 3 minutes. Set aside for later use. Place the chicken breasts onto the cast-iron grill pan and cook for about 5 minutes on each side, or until completely cooked through. Remove from pan, allow to cool for about 2 minutes and slice into thin strips. Place the pasta into the boiling water and cook until al dente and drain. 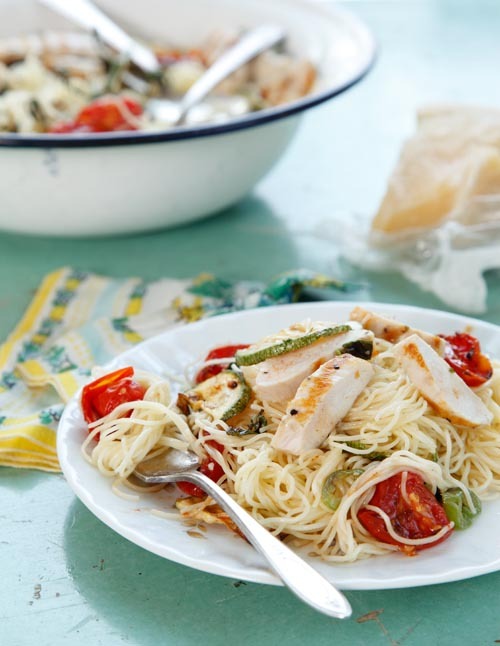 Toss the pasta with the grilled vegetables, top with the sliced chicken breast and drizzle over the desired amount of olive oil, parmesan cheese and basil leaves. Season with salt and pepper and serve. This is a recipe I’m going to use, this looks delicious! I have some ideas to change some stuff on it but it’s still the perfect pasta dish without having to much sauce all around! Delicious! Just made this now, thanks for the lunch idea!